The printf() function formats the string it has been asked to print by expanding placeholders and modifiers. It then calls the function putch() to send each character of the formatted text to stdout. By customising the putch() function, you can define the destination of stdout and have printf() 'print' to any peripheral on your target device. To use the UART console feature in the IDE, you must ensure that your putch() function sends its argument to the transmit register in the UART. The following code will work with most devices and you can copy this into your project. It will be called automatically by printf(). So that the IDE knows it should be redirecting UART transmissions to a console window, you need to enable this feature. To do this, open the Project Properties dialog for your project. 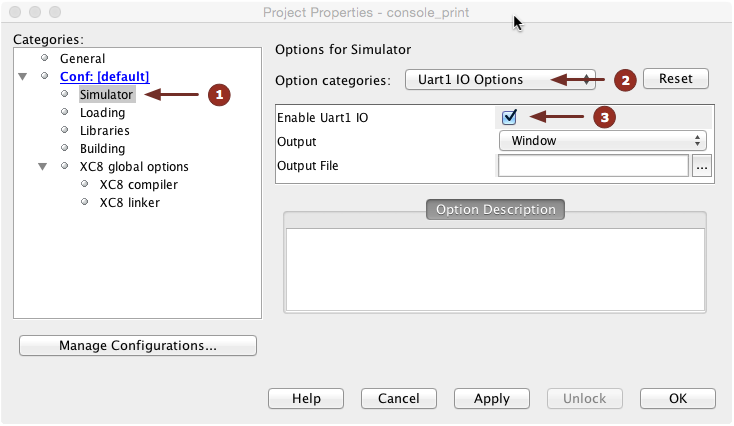 Select the Simulator category, then, in the right-hand pane, select the Uart1 IO Options options category. Finally, enable the checkbox marked Enable Uart1 IO. The UART 1 Output window will be automatically opened by the IDE once you run your program in the simulator.